They might be rooted at the foot of the League One table, but scratch beneath the surface and AFC Wimbledon are a club with a positive future. The Dons are set to move to a new £25m stadium 250 yards from Wimbledon FC's old Plough Lane ground where the infamous 'Crazy Gang' used to play. One of their sponsors is bestselling American novellist John Green, while there is a Hollywood film in the offing documenting the fan-owned club's rise from holding trials on Wimbledon Common in 2002 to the Football League in 2011 after five promotions in nine seasons. In 2007, AFC Wimbledon played Suffolk village side Debenham Leisure Centre in the second qualifying round of the FA Cup. On Saturday the phoenix club, founded by supporters after the old Wimbledon FC was given permission to relocate to Milton Keynes, play host to Championship side Millwall for a place in the quarter-finals. 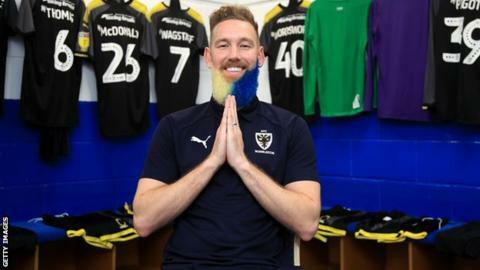 In true Crazy Gang spirit, midfielder Scott Wagstaff, the two-goal hero against West Ham in the fourth round, has dyed his ginger beard in the club's blue and yellow colours for the tie. Erik Samuelson has been at AFC Wimbledon since the club's inaugural season in 2002-03 when they played the likes of Viking Greenford and Frimley Green in the ninth-tier Combined Counties Premier Division. "I'm not a co-founder but when it looked like the club might happen, I wrote a business plan and I was appointed finance director," Samuelson told BBC Sport. "In the early days we all volunteered - it was really important to show there was nothing the directors shouldn't be prepared to do. "I used to run the car park on match days and when they made me chief executive in 2007 there was a headline in the programme which read 'car park attendant made chief executive'." AFC Wimbledon have earned £405,000 in FA Cup prize money this season, while they will pocket a further £360,000 should they defeat Millwall at Kingsmeadow. The run started at non-league Haringey Borough on 9 November but soon afterwards manager Neal Ardley, a stalwart with the old Wimbledon FC, left and Wally Downes, another Wimbledon FC old boy, was appointed. AFC Wimbledon's road to the fifth round has included two 90th-minute winners, as well as a famous night against Manuel Pellegrini's Hammers. It has proved a welcome distraction from their league troubles. Seven points from safety with 14 games left, they face a first relegation unless they turn their season around. "No one wants to be relegated," added 70-year-old Samuelson, one of the few chief executives operating in the Football League on a voluntary basis. "It's not over yet. One of the things about AFC Wimbledon is our resilience. We've overcome all sorts of things to get to where we are." AFC Wimbledon's squad, which cost around £150,000 to assemble, is a mixture of youth and experience. Nineteen-year-old Toby Sibbick scored against West Ham, while 32-year-old Andy Barcham once played in a League Cup tie for Tottenham alongside Edgar Davids and Jermain Defoe. Midfielder Anthony Wordsworth has featured in all four FA Cup ties this season and is hoping his 'spiritual stones' will provide positive energy in the dressing room before the Millwall tie. The former Ipswich and Colchester player turned to them to help cope with the loss of his older brother, Steven, who died after a heart attack at the age of 40. "It happened just over a year ago," said Wordsworth. "I was having a difficult time dealing with it and one of my friends suggested I should try the stones. "They come in all colours, shapes and sizes. It's very spiritual. I bring them into the training ground and on match days just to try and provide some positive energy." Wordsworth was at Wimbledon FC's academy from the age of seven and often attended first-team matches, meeting the likes of Neil Sullivan, Efan Ekoku and then-chairman Sam Hammam. "My brother said 'no' and he said 'you'll be no good for us then'." A new chapter for the Dons? Green is the bestselling author of Looking For Alaska, An Abundance of Katherines, Paper Towns, The Fault in Our Stars and Turtles All the Way Down. In 2014, AFC Wimbledon announced a sponsorship deal with Green, whose works have sold more than 50 million copies. Since then the 41-year-old has pumped tens of thousands of pounds into the club after increasing his involvement. Kingsmeadow includes a 944-seater 'John Green Stand' which promotes his books on the front of the roof. So why did one of the world's biggest young-adult authors develop a soft spot for a lower league club in England? "AFC Wimbledon is an amazing story and I love it," Green told BBC Radio London in 2014. "It's a team built from scratch. I think I am the first novelist to sponsor a professional football club. It feels like a great fit. "The sponsorship is a long-term project and I want to be around when they are promoted to the top flight." Green is also looking to co-produce a film charting AFC Wimbledon's rise after an agreement was reached with Hollywood studio Fox 2000. AFC Wimbledon hope to move to Plough Lane for the start of the 2020-21 season. Work is expected to start in April on the venue, which will initially have around 10,000 seats. The site is a stone's throw from where Wimbledon FC's ground, which has since been turned into several blocks of flats, used to be. The original club last played there in 1990-91 before sharing Selhurst Park with Crystal Palace. "It's an irony that the best site in Merton for the new stadium is so close to the old one," added Samuelson. The new stadium will include two gates, daubed with the words 'Womble till I die', which were retrieved from the old ground, and Samuelson added: "We're going home."